Neighbours contacted this company to repair brickwork at front of their townhouse and to reset a stone walkway which was deteriorating. 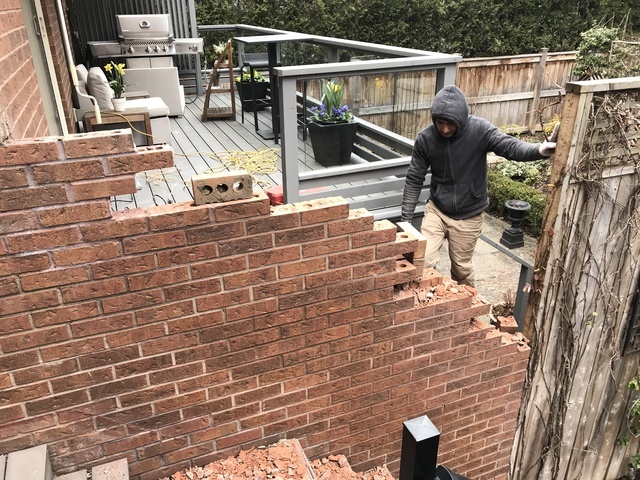 Our shared red brick wall had serious water damage and was flaking badly ..so we joined the project. They matched the brick perfectly, worked so hard and such long hours and did just the best job. I would highly recommend this company ..so helpful, professional and they did the best job. In doing a decoration project on our town house, I found two fabrics which I wanted put on the walls of a bathroom and powder room. It was not easy to find a craftsman to do this, but Roderick Dunn, agreed to take this job on and he did a wonderful job. I would not hestitate to recommend him for painting and this fabric installation. Sorry I can't remember the price but it was fair for the work done. We went to 3 other companies - had house measured and estimates done - their price was very fair, not at all overpriced for the quality of the rugs chosen and the care of the installation and furniture help. I know now two other homes equally happy with them and have now referred them to friends. And they planned the amount of carpet needed so well that there are just a few small pieces left over ..amazing for the amount we ordered. You won't be disappointed - business like, on time, wonderful.